Give your baby the best start in life. Your baby is an eager responsive and receptive learner! She, along with her special grownup, will smile with delight as she is hugged in music, movement, colorful patterns and soundscapes. This is the perfect musical and developmental head start! A strong foundation to grow and thrive. 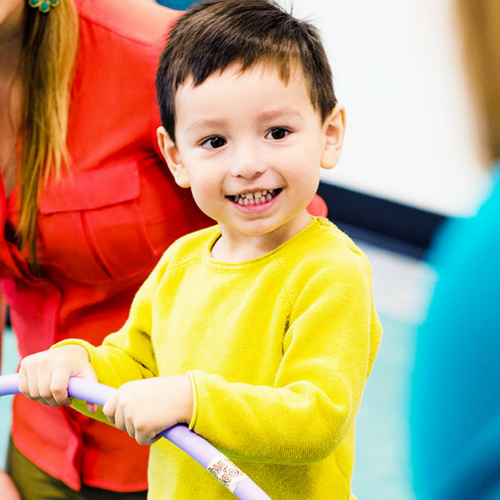 Get ready to sing, play, and move with your little one in this high-energy music class designed for older babies and young toddlers. Together we'll explore lots of singing, swaying, laughing, and playing through a just-right mix of early-childhood vocal play and language development, together time, and music and movement activities! Watch your toddler come alive with delight. You’ll love watching your toddler blossom musically, developmentally, and socially. We will help you bring out the very best in your child. You will be amazed at your little one’s musicality and capacity to learn in this delightfully engaging and flexible environment. Best of all, you're right there with your child, interacting with one another, learning together, supporting a musical head start, and making the most of this precious time in the life of your child. Your preschooler will blossom with confidence. Kindermusik Level 3 offers your preschooler the best of everything. We’ve got social, emotional, early language, and motor skill development covered, plus your child gets the added benefit of music permeating everything we do to get those neurons firing! We know that preschoolers thrive on pretend play so Level 3 classes include songs, stories, and instrument ensembles to nurture your child’s budding creativity.